Amaranthus retroflexus is an annual C4 herb (Downton 1971; Costea and Tardif 2003), to 2 m tall, from a reddish taproot, stem stout, erect, branched, usually pale green but stressed plants often red-stemmed, at least below, mealy-wooly-hairy. Leaves alternate, stalk elongate, blade to 10 cm long egg-shaped to diamond-shaped, hairy below at least on veins, veins whitish below. Flowers pale greenish, male and female separate in same inflorescence (monoecious), (no petals) sepals 5, 0.3-0.4 cm (in fruit), curving slightly outward, tip blunt, often notched, longer than fruit, surrounded by stiff, awl-tipped bracts 0.4- 0.8 cm long, much longer than sepals; inflorescence of many dense, thick, compact, bristly, spike-like panicles, in nearly head-like clusters or lobes, the principle one to 20 cm. Flowers wind pollinated and self-fertile (autogamous), (Mulligan and Kevan 1973); blooming and fruiting Aug.-Oct.
Fruit dry, membranous, 0.2 cm splitting around center to release one blackish, shiny disk-shaped seed. Seeds eaten by numerous birds and small mammals. Seeds viable in soil up to 10 years, a few may survive up to 40 years (Costea et al. 2004). Frequency in NYC: Infrequent. Probably more frequent in weedy, uninventoried sites. Habitat: Open, disturbed areas, roadsides, sand, dry fill. Notes: Very similar to A. hybridus but hairier, paler green and with a wider inflorescence. Susceptible to numerous plant viruses, mostly those tested from crop plants (Brunt et al. 1996). Plants eaten by rabbits (Martin et al. 1951). Seed preyed upon by Coleophora lineapulvella, a micromoth whose only food consists of these seeds and those of A. powellii. 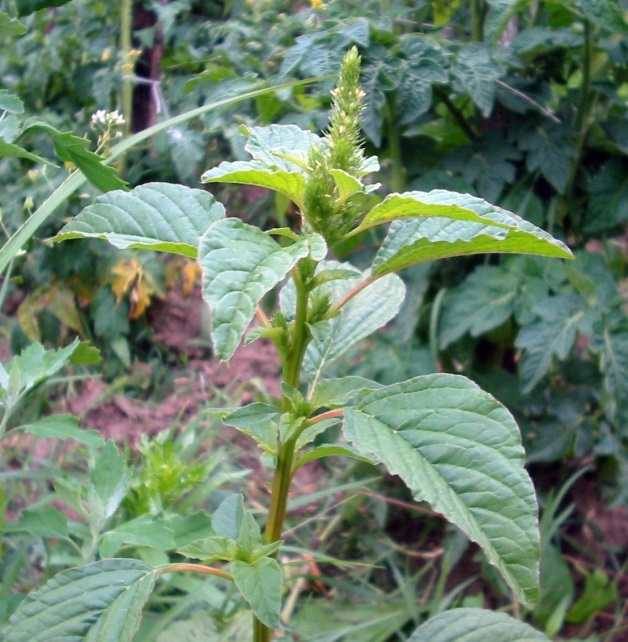 Red pigweed is associated with a very long list of insects from numereous families. Plants preyed upon by a number of nematodes and infected by numerous fungi (Costea et al. 2004).